We're planning to check out the film Marinoni: The Fire in the Frame tomorrow night at the Globe. Showtime at 7:00 pm. All are welcome to come. The Globe is a little old school, as tickets are only available at the door. Another long day in the saddle. 16 of us headed out to Osoyoos, over Richter, the forever headwind rollers into Keremeos for a Subway meal. Then off to Green Mountain Road. Jay, Spencer, Suchaet and Rob conquered Apex while the rest of us headed straight down home. For the non-superheroes we did 164 Km with 1800 metres of elevation. Add another 24 Km and about 900 metres for the Apex crew. Chapeau!!! Then dinner at Salty's for the whole group. A great week of training. Thanks Harely for organizing! Meet at Denny's at 10 am, we'll ride to Tickle Berry's for ice cream and then ride home! Super sweet! Meet at Salty's on Lakeshore Driver for 7 pm. They don't take reservations so a couple of us are heading down early to try and get a spot for ~20 of us on the balcony. If that fails, we'll be inside somewhere! UPDATE: THE WEATHER LOOKS BLAH FOR SATURDAY: 10C WITH 60% CHANCE OF SHOWERS. UGH. I'M CANCELLING THE SATURDAY RIDE. MONDAY IS A GO, AND IF FOLKS ARE INTERESTED, WE CAN MODIFY THE ROUTE TO INCLUDE HILLS AND SOME DISTANCE. Meeting Point and Start Times: Rides will start at 9:30 am at the Travel Alberta Visitor Information Centre on Bow Valley Trail at the west end of Canmore, and we'll start each day by riding the Legacy Trail as a warm-up. Saturday, May 16: Banff Hill Ride - Legacy Trail, Minnewanka Loop, Tunnel Mountain Road, Banff Hot Springs, and Mt. Norquay. The attached map is a little inaccurate on the distance, as it doesn't include the ride back to Canmore. If we're feeling good, repeats on Norquay is an an option. What's not an option is a stop at the Whitebark Cafe for a coffee. That's happening. Sunday, May 17: No ride planned. Do your own thing, spend time with family, mow the lawn, whatever. Monday, May 18: Lake Louise Century Ride - Exactly as it sounds: an out-and-back to Lake Louise on the Bow Valley Parkway. Lunch stop at Laggan's bakery in Lake Louise, and re-fuel if needed at Castle Mountain Junction on the way out and back, if needed. This is a an un-supported ride, so bring all the clothing, food, and tools you'll need. Pace should be steady, but socialish, with some tempo work. If the weather turns awful, keep an eye on the blog for updates. It is the mountains, so be ready for anything. Today's overcast and slightly cool early start was well attended with 23 people heading out towards Oliver for the Mt. Baldy climb, with an extended option of continuing on past the gravel to climb the backside of Anarchist and head down in to Osoyoos for lunch before heading back to Penticton. We met Trev in Oliver and he lead a handful and a half of guys out for the long ride. The rest of us did an out and back up Mt. Baldy with super strong finishes all around! We were thankful for the cool, overcast skies as we all put the hurt on to get up that climb. Cheers all around as we finished at the gravel, lots of food and water, and a quick descent before heading back to Penticton for a much needed coffee and lunch. We have reservations for the Hillside Winery for 5:00ish. Hillside is at 1350 Naramata Rd. Hey Andrew, you're supposed to do that at the top! Harley led about 20 of us out today. Another beautiful day later cooled with cloud cover - perfect cycling weather. Up Anarchist with Jay crushing all. Followed by lunch at the "Best Timmies in Canada" Fast cruise back to Penticton with Jenn calling the monster session over the last stretch. 172Km, 2000 metres of elevation. Smiles all around after 160K! Thanks to Harley for great organization! PS - Klaus - remember your water next ride. The Wednesday Night Series kicks off tomorrow with the Woodland ITT. All the details can be found over at the C4 Wednesday Night Series blog. To participate, you must be an STC member AND purchase a $35.00 secondary-level club membership through Crankmasters at www.calgarycycling.com. 15 races for $35.00 is a pretty good deal. Day one started with lots of sun, a high of around 27C, light breezes, and 14 folks joining us for the first 100+ kilometers of what looks to be a fantastic week. We had a couple of good pushes by a few folks during the ride through Oliver, Area 51, and OK Falls, but everyone looked great and finished strong. Looking forward to tomorrow! Let's try to get together to eat as a group a few times in the evening this week so we can share battle stories! No obligation to attend, but if you'd like to join us, aim to be there around 6:30 pm. We may adjust this on longer race days, I'll post here if so. I'll post for the rest of the week over the next few days. The 2nd epic day at 180 km. Did you know B.C. also hosts the best Subway on the continent?!?!?! Well it does, in a little place called Keremeos!!! Super sweet! This day we will ride the Iron Man Loop and Apex. Correct!!! 2 major climbs again! I know eh! 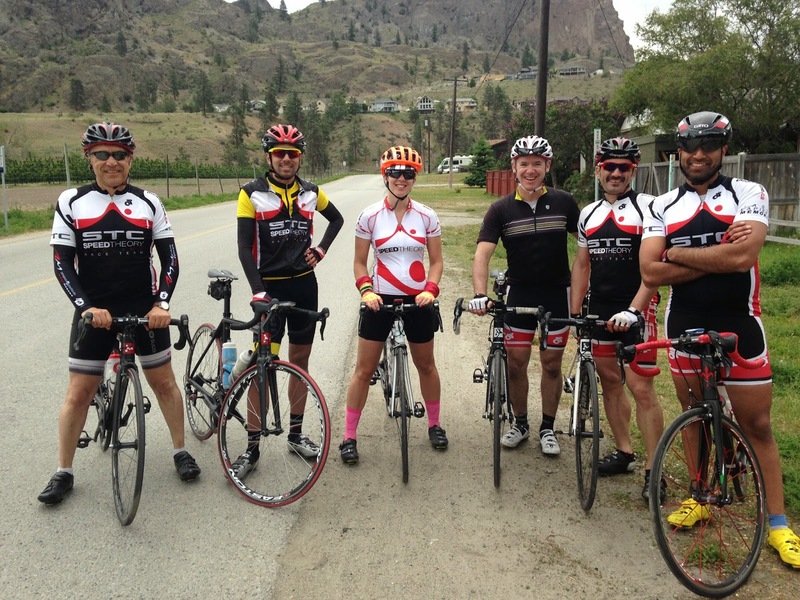 We ride out to Oliver for our 1st pit stop, 2nd pit stop in Osoyoos. We leave Osoyoos ascending Ritcher Pass followed by lunch in Keremeos. After lunch we continue up highway 3A then turn left up Green Mountain Rd. We will regroup at the Apex Turn off. 4th stop is involuntary at the top of Apex where you will have a conversation with your-self about your true intellect.....you will loose this conversation. :( But hey, then you get to go home! This is the first of the epic days, Mount Baldy!!! There are 2 routes for this day, one up and over Mt Baldy and and one to the gravel. Everyone rides out to Oliver together where we can pick up more water and have a quick bite. The "to the gravel" route is 127 km as is as it sounds. You ascend Mt Baldy until the road turns to gravel. You then descend and continue on to Osoyoos and ascend Anarchist and meet the other group head on. You may continue all the way up to the Sasquatch if you like. We will regroup and have lunch again at the Timmies in Osoyoos. After lunch we will return to OK falls via the highway then turn right onto Eastside Rd to return to Penticton. Day 5 ride option 1 here. The full route is truly an epic ride at 195 km with lots of gravel. There are is no food or water between Oliver and Osoyoos so be sure to stalk up. You will ride up and over Mt Baldy and then up and over Anarchist followed by a lunch stop again at best tasting Timmies in the whole world!!! Yeah baby! You then ride back to Pentiction on the same route as the shorter loop. There is a good chance you'll forget your name on this route so maybe write it down somewhere, but don't worry, it will be Fun!!!! Day 5 ride option 2 here. This is will be the rest day at 72 km. We will ride out to Summer Land and continue on to Camp Boyle. We the return back to Summer Land and stop for a coffee and a treat. (If someone can remind me of the name of the coffee that would be great!) 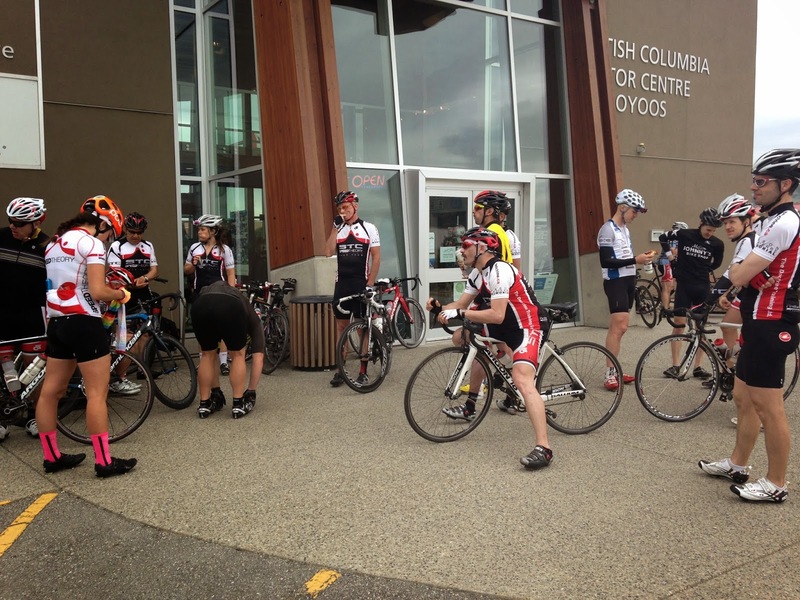 We then ride back to Penticton and meet up yet again for more treats at the Bench! Sweet! There is no real climb and very little elevation gain on this ride plus the pace will be casual. This is the first long day. We will again stop in Oliver for food and water then continue on to Osoyoos. There will be no stop for food in Osoyoos before Anarchist. The climb up Anarchist will end at the Sasquatch as always. We then descend back to Osoyoos where we stop for a full lunch at the Timmies!!! Best Timmies in all of Canada, especially if it hot out! ;) After Tim Hortons we will ride back to Penticton the same way we road out. A little harder and slightly shorter at 99 km. We will start with "The Wall" then up to White Lake Rd with a stop at the end of White Lake Rd for food, water and facilities. We will then ride up Green Mountain Rd then down to Penticton. Penticton Day 1 May 10th Ride!! Sorry for late post everyone, here are the details. All rides start in the Denny's parking lot on Burnaby Ave.
Day 1 9:30 am: A shorter day at 103 km to help everyone get warmed up. We will make a quick stop in Oliver for water, food and facilities. Then continue up to area 51 and home through OK Falls. Banff/Canmore May Long Weekend Mini Training Camp? Circumstances prevent us from heading to Penticton this year. For others who also can't make it to BC this year, any interest in a May Long Weekend (May 16-18) mini camp in the Banff/Canmore area? Rides could include the Minnewanka Loop, Norquay climb, 1A Parkway, Tunnel Mountain, etc, etc. Comment below, and if there's enough interest, I'll post some rides. P.S. If you've sitting on the fence about Penticton, GO TO PENTICTON. Don't skip Penticton to come on this instead. Seriously. Vineyards, warm temps, quiet roads,big climbs...Just do it. Penticton Training Camp Row Call. Looking to get a list of all who are attending the Penticton Training Camp this year! First 3 days of riding will be posted soon so stay tuned. Alright! 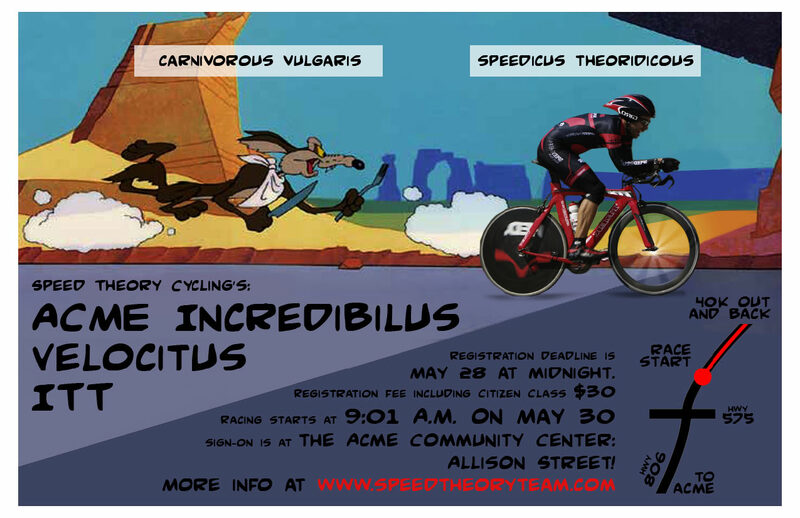 The Velocity Stage Race is coming up. It is the first ABA road event of a rather slim road racing season, so let's make it count. This year's edition features a 7 km Individual Time Trial on Saturday morning, followed by the Road Race on Saturday afternoon - both East of Edmonton. Sunday morning is the Criterium at the Edmonton Research Park in South Edmonton, so you can be back in Calgary for Sunday dinner. The ITT and RR courses are mostly flat with some tree protection from the inevitable crosswinds. As with all stage races, you need to complete the previous stage in order to start the next one. Not sure if that means you need to complete the *entire* RR in order to start the CR, or at least 50% of it. Remember, the Training Forum is where all the action is! It is great to see all the action in the Training Forum and special thank you's to Marie for hosting the Women's Skills Night and Skill Ride this week, and as always to Harley for hosting the Thursday night Skills rides. I see Carl has already got the Wheelers ride going, hopefully there was an OK turn out. Even if you are new to the club, don't hesitate to post a ride, just state the intention, 'Social No-Drop Ride', or 'Training Tempo Ride', or 'Hammer', or 'Coffee Shop Tour', or whatever, but just post it! Having someone to ride with is always a better option than riding alone. Here is the direct link to the Training Forum. 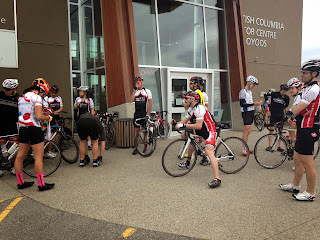 A lot of the club will be out in Penticton next week, so it is up to the ones left behind to keep up the Training Forum. Harley, Ernie, Marie will all be in Penticton, so get on it!